In this tutorial we will create a type visualizer for our own vector-like array class. Before you begin, please follow the getting started tutorial to make a very basic "dummy" visualizer and ensure that it works and can be debugged. Open the MyTypeVisualizer project (C# visualizer from the previous tutorial) and run it. A new instance of Visual Studio will start (and will be debugged by the first instance of Visual Studio). Build the project. Place a breakpoint at the "return 0" line and start debugging. When the breakpoint is hit, hover the mouse over "test" to see its value: Notice how the value of "test" has been changed to "Hello, Visual Studio" by the basic visualizer from the previous tutorial. The type visualizers are based on the Expression Filter mechanism. Expression Filters can replace arbitrary IExpression objects with their own implementations. In most of the cases creating an instance of StaticExpressionFilter and specifying which fields to override should be sufficient. We will now make a visualizer that will use the m_Count value to display the collection elements. Note that you can use "Break All" command in the outer Visual Studio to stop the inner Visual Studio, and then edit the visualizer code directly. Edit-and-continue will patch the visualizer on-the-fly, so you won't need to restart Visual Studio or even restart the debugged C++ program! 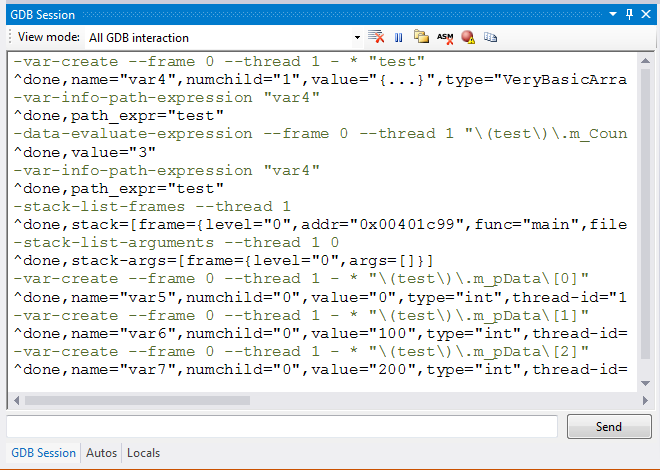 Note how we have queried the element count: first, we derived the GDB expression for it using IExpression.FullNameForEvaluator (would be 'test.m_Count' in this case). Then we evaluated it using the IExpressionEvaluator interface. Finally we ensured that the returned value is a valid integral number (VisualGDB parses it automatically and returns ExpressionValue.Integral) and extracted the integral value (of type ulong) from it. Note that we have simply "moved" the IExpressionChildProvider from the original expression node to the newly created node. We did not have to query any actual members at this point. Note that the element names still have the format "(test).m_pData[i]" that corresponds to the raw GDB expressions, but is not very user-friendly. To fix this, we could wrap the child expressions returned by IExpressionEvaluator.CreateExpression() using StaticExpressionFilter and override the ShortName. You can download the source code for the example in this tutorial here. The code in the archive is provided under the BSD license (no restrictions, no warranty).